I have found the perfect cereal for everyone because everyone designs what they want in their own cereal. 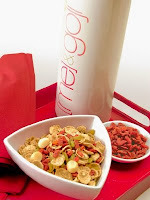 [me]andgoji is where 3 clever and wise founders are thinking outside the cereal box. The company’s website, [me]andgoji, allows the consumer, you or [me] to choose which ingredients you want in your cereal offering the most healthful and flavor bursting super foods from around the world. Design your cereal from 50 plus all natural and organic ingredients, something for everyone even those with specific dietary needs. I was fascinated as I designed my cereal to watch the nutritional facts immediately update itself with each ingredient addition. A very clever and technically advanced site it is apparent that the 3 young owners are having fun and offering out a product that enhances life and our earth. On Earth Day they planted a tree for each cereal purchased that day. Let me not forget that 5% of the profits are going to charity.